In 2012, four new species of tiny chameleons were identified. Found on a tiny island off the coast of Madagascar, the smallest of four, named Brookesia micra, grows to be, on average, just 1 inch (2.5 cm) long. How small is that? 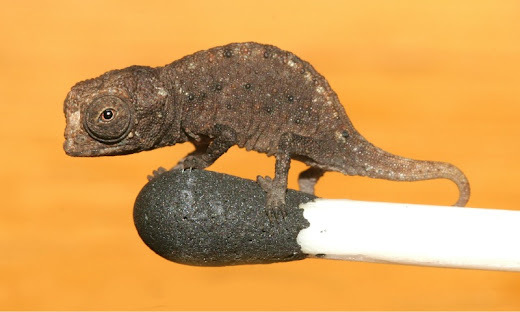 Brookesia micra can fit comfortably on the head of a matchstick. It is one of the smallest vertebrates ever found on Earth. How did researchers locate lizards so little? They had previously found tiny chameleons on neighboring Madagascar, and they knew that the animals were active during the day. So they searched tree branches on this island at night, when the animals were sleeping. Brookesia micra climb up into tree branches to sleep, but because they are so small, these lizards only climbed about 4 inches (10 cm) off the ground! In 2012, paleontologist at a dig site in Zaragoza, Spain, found a piece of a jaw belonging to an 11.6-million-year-old species of bear. They determined that this fossil was from a newly discovered ancient bear species called K. beatrix, and that K. beatrix is a relative of the giant panda in China. Before this, the oldest known panda was "only" 7 to 9 million years old! Scientists can tell a lot from the fossils they found. The jawbone indicates that K. beatrix probably ate tough plants, much like today's bamboo-munching giant panda does. They also believe that K. beatrix weighed about 130 pounds (59 kg. ), making it smaller than any of the bear species that exist today. Its size, however, would have made it easier for K. beatrix to climb trees to avoid the bigger predators of its time. What scientists haven't figured out yet is how K. beatrix made it from Spain all the way to China. Or whether it had the same black-and-white markings that modern-day giant pandas do. In September 2011, after a three-week hunt, villagers of Bunawan, in the Philippines, along with local wildlife officials, successfully captured a saltwater crocodile suspected of killing two people and attacking several more. They didn't know if they had caught the right predator, but they quickly realized that they had caught an enormous one. The crocodile, named Lolong in honor of a crocodile hunter who died shortly before the critter was captured, measures 20.24 feet (6.17 m) long and tips the scales at 2, 369 pounds (1,075 kg.). These stats make it the largest crocodile in captivity, and, in July 2012, Lolong's size was recognized in the Guinness Book of World Records. Before Lolong, the record holder was an Australian-caught saltwater croc that was 17.97 feet (5.48 m) in length. Lolong lived out his days being cared for in an ecotourism park in Bunawan, becoming biggest tourist attraction in the area before his death in February 2013. While researchers are still discovering new species, according to the United Nations Environmental Program, upwards of 150 species go extinct every day. Enter the Frozen Ark, a worldwide association of institutions, including the Natural History Museum, in London; the Zoological Society of San Diego, in California; the Dublin Zoo, in Ireland; and the Center for Cellular and Molecular Biology, in Hyderabad, India. The Frozen Ark, based within the University of Nottingham, in England, is saving the DNA and some cells in the world's animals. One day, this material might be used to keep species alive through cloning. The Ark currently has 48,000 samples of more than 5,500 animals, including both endangered and non-endangered species. 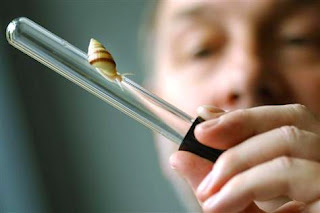 A Zoologist(scientist who works with animals) at London's Natural History Museum will take DNA samples from a endangered Polynesian tree snail and store them in the Frozen Ark. Thank you for reading Animals in the News; As for Kwentologist posted on the website Kwentology if you want to redistribute this article please include the link as the source. Have some kuwento to share? Contact us!